I lived through my teenage years at a time when liking Oasis was the "in" thing to do. When you'd see a mop-topped Liam Gallagher leaning forward to the microphone inimitably, being and showing us how to be a Rock 'N' Roll Star. As far as iconic, even, if you'll forgive me, Supersonic musical moments went, this was hard to top. Happily, for the countless fans that decorate Belfast’s SSE Arena, Gallagher – and we can refer to him as that, since brother Noel is nowhere to be seen – has a selection of Oasis classics to entertain us with, and quite a bit more to boot, including tracks from first studio album As You Were. But first, the support. After a solid, laid back set from Kyle Falconer of The View, it is The Strypes' turn to dominate the stage with tempo raising, genre hopping versatility on the blues, pop and rock spectrum. Their lack of apparent refinement is a strength, their spindly frames and seemingly stiff gaits masking chaotic, energetic and vibrant theatricality, with some Public Service Broadcasting-esque sound samples as a bonus. Theirs is a presence very close to completing the transcendence from small club entertainers to full blown arena rockers, something the likes of Franz Ferdinand couldn’t do for me. Gallagher himself arrives to the sight of an extremely loud roar with flashing lights everywhere. This atmosphere calls for a couple of very famous songs, and Gallagher and his band oblige, launching instantly into Rock 'N' Roll Star and Morning Glory. A little hoarse and a little receded he may be, but it's a real treat for nostalgists, and quite electrifying, surely, for those not so familiar with Oasis. That, sadly, is as good as it gets. The blunt and to-the-point song interludes, a typical Gallagher characteristic (or so I'm told), leave this observer cold, ensuring that virtually the whole gig hangs on Gallagher's persona during the songs themselves, if not the sharp instrumentals and impressive pyrotechnics. I'm tempted to argue that were it not for his fan base and very popular music catalogue, Gallagher would be upstaged by The Strypes. As he tries to blend the new and the old, a little too well it has to be said – such is the repetitive and samey nature of the show as a whole – one has to ask, what is Liam Gallagher now? Is he going through a musical regeneration, or does he still want to be the rock 'n' roll star of the 1990s? This is like a Live Oasis Reunion Special, without his brother and with a very thin icing on a rather bland-tasting cake. There are times when, much to one's delight, the nasal drone gives way to pride and passion and we are reminded of how powerful a presence Gallagher can still be. A combination of timeless energy and new found maturity. But this doesn't happen often enough. And while tunes like Supersonic, Cigarettes & Alcohol and Some Might Say are performed with expected panache, I must emphasise "expected". There's something very going-through-the-motions about it all. Too often, he plays it safe, which is especially disappointing in what's actually a rather truncated set list. Where Ocean Colour Scene's Belfast show looked back and injected old favourites with welcome, lively warmth, Gallagher's is a tale of staid regurgitation caught somewhere in between fan pleaser and conflicted artist. It really is As You Were for Gallagher, but I'd much rather it were As You Are... in other words, less inclined to what he could be there then and more towards what he can be here now. His music may well live forever, but after this I am left pondering whether or not one would actually want it to. 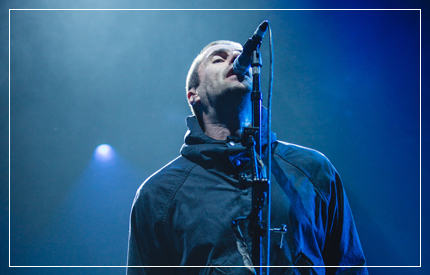 Liam Gallagher performed at Belfast's SSE Arena on Monday October 30. Tickets for his performance at Belsonic 2018 are on sale now.